12. 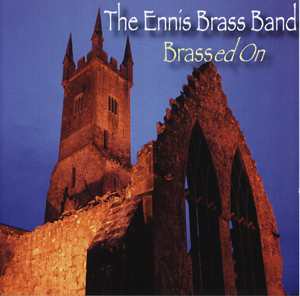 Theme from "The Mission"
As a Garrison town, Ennis has a long tradition of Brass Bands — from the classical marching band, to the "Big Bands" of the 1950's, the medieval streets of Ennis have for generations resonated with the sound of brass. After the Second World War, or "Emergency", participation in the band began to wane. It was reformed in the 1970's by a group of dedicated members and community leaders, and the band began its current life as a civic-minded voluntary group, dedicated to teaching musical skills to the children of the town, and fulfilling the role of a municipal Brass Band. Performing locally and nationally at various concerts & festivals, the band has also represented Town and County at competitions all over the country. The Ennis Brass Band hat triumphed at Junior, Intermediate and Senior levels at both National and Regional Finals, over the years, and has recently won the Limerick International Festival two years running. The band has also travelled and performed extensively on the European Mainland and the UK. Principal Cornets: Clodagh Power. Ailin McAllister. Solo Cornets: Aine McAllister. Alice 0' Hanlon. Sarah Power. 2nd Cornets: Darren 0' Connor.Eamon Glenny.Sean Campbell. 3rd Cornets: Sean Whelan.Oisin Tiernan. I st Horn: Meadhbh 0' Sullivan. I st Baritone: Eddie Glenny. I st Trombone: Grainne Coffey. 2nd Euphoniums: Colum O'Toole. Deirdre Coffey. Eb Basses: Bernard McAllister. Niall Foudy. Percussion: Kieran McAllister. Gary McAllister.